What is the Honesty Gap? 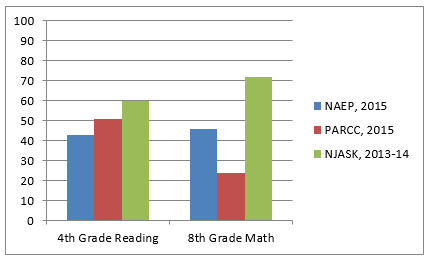 Through the implementation of PARCC assessments, New Jersey narrowed gaps between state-reported and NAEP proficiency rates by 10 percentage points in fourth-grade reading and 1 percentage point in eighth-grade math. It is noteworthy, however, that according to the NJ Department of Education, approximately one-third of the eighth grade students in New Jersey did not take the eighth-grade PARCC assessment, and instead took the Algebra I exam. By and large these students were high-performing and thus their absence skews the resulting percentage of students earning proficient scores. Click here to view the state’s previous results. A Look Back: Last May, Achieve released an analysis that identified discrepancies in student proficiency rates reported by state tests and those found on the National Assessment of Educational Progress (NAEP), known as “the Nation’s Report Card.” The analysis – deemed the “Honesty Gap” – found more than half of all states demonstrated a 30 percentage point or more differential between proficiency rates calculated by state tests and NAEP. That meant states were not being straightforward with parents and educators about students’ preparedness for high levels of learning, and ultimately for college and careers—often with serious consequences. About 32 percent of New Jersey students entering four-year colleges and 70 percent of first-time students entering community colleges require one or more remedial classes before they can begin taking credit-bearing coursework. Prioritizing Accurate Information and Transparency: For the first time this year, most states administered tests aligned to rigorous academic expectations. As a result, most began reporting proficiency results that more closely reflect the rates identified by NAEP. The Collaborative for Student Success identified Massachusetts, New York, and Utah as “Most Honest” for significantly closing the Honesty Gap and reporting proficiency rates nearly identical to or even more rigorous than NAEP. Additionally, 26 states are recognized as “Significantly Improved” for closing their Honesty Gaps by at least 10 percentage points in either fourth-grade reading or eighth-grade math. Twenty-four states, including Arizona, Arkansas, Colorado, Connecticut, Delaware, D.C., Georgia, Idaho, Illinois, Maine, Maryland, Massachusetts, Michigan, Mississippi, New Hampshire, New Mexico, New York, Rhode Island, South Carolina, South Dakota, Utah, Vermont, West Virginia and Wisconsin, earned the status of “Top Truth Teller in 2015” for having Honesty Gaps of fewer than 5 percentage points in one or both subjects. New Jersey’s Ups and Downs: In 2010, New Jersey adopted college- and career-ready standards in English language arts and math. Last spring, New Jersey administered PARCC assessments, which measure students against challenging academic expectations. As a result, New Jersey’s latest student test results more closely reflect proficiency rates identified by NAEP, indicating that parents and teachers are now getting more accurate information about their children’s readiness. While gaps still remain, the adoption of proficiency standards identical to other PARCC states helped NJ make significant progress towards closing their Honesty Gap. Policymakers should hold firm on the use of these assessments and their definition of proficiency. By doing so, they provide parents and teachers with honest information about how well prepared their child is to move onto higher level material based on college- and career-ready standards. For more information read more: What is the Honesty Gap? © The Honesty Gap 2019. All Rights Reserved. | A project of the Collaborative for Student Success.